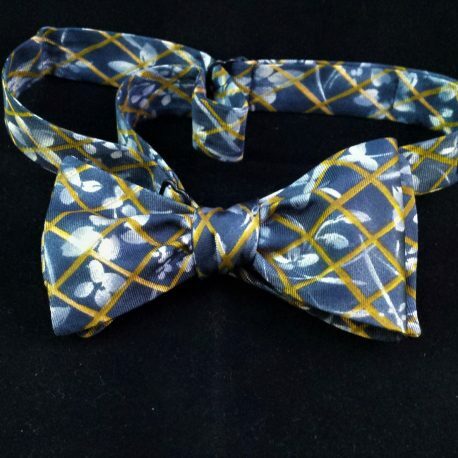 Silk batwing style bowtie. Navy blue with white flowers behind a green lattice. A very interesting and artistic pattern. These colors will look great with a blue seersucker or tan jacket or an olive suit. Made from reclaimed fabrics. 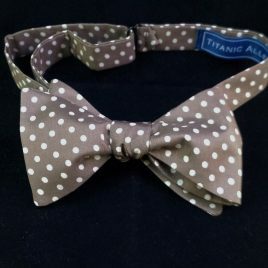 Butterfly style bowtie. Tan with white polka dots. Simultaneously conservative and whimsical! Also available in a slimmed-down batwing style. Made from reclaimed fabrics. Reversible silk batwing style bowtie. 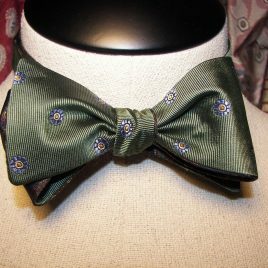 Green with blue flower/dots on one side, complimentary navy and green paisley on the other. Two looks for the price of one! Made from reclaimed fabrics. 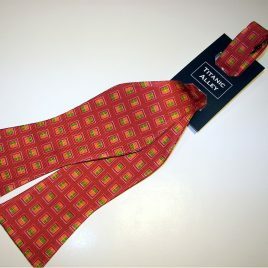 Silk batwing bowtie in orange with green and yellow blocks. Made from reclaimed fabrics. 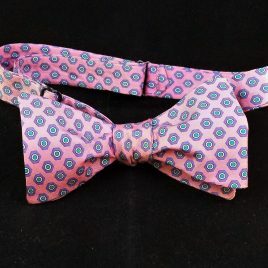 Butterfly style bowtie. Pink with blue and green hexagans and dots. Great for adding a pop of color to a muted outfit. Made from reclaimed fabrics.